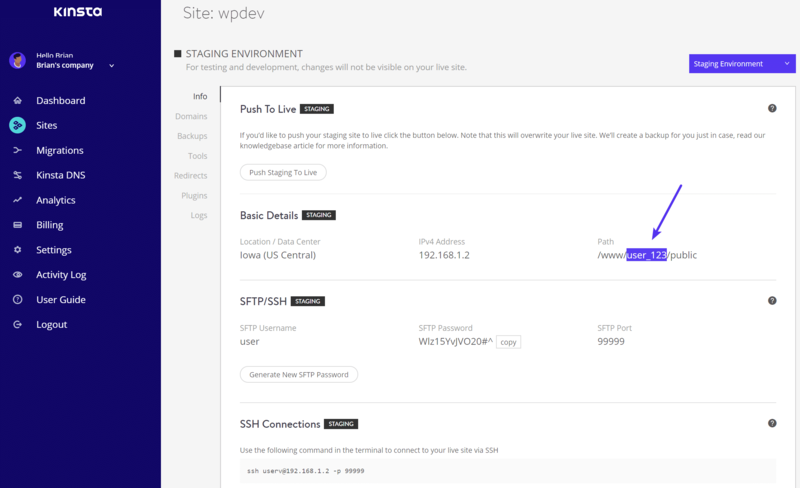 Kinsta is a managed WordPress host that comes with SSH access, Composer, and WP-CLI out of the box. Starting at $30/month, Kinsta’s plans make sense for anything from basic brochure sites, to WooCommerce stores, to your Bedrock-based WordPress applications. Kinsta supports our open-source projects both on their infrastructure and by financially contributing to the development efforts. Long before our relationship with Kinsta, they’ve been the only managed WordPress host that we’ve ever felt comfortable recommending. Several Roots team members have trusted Kinsta with hosting their sites that they don’t ever want to have to worry about going down. First, make sure your public SSH keys are added to the MyKinsta dashboard. Trellis can deploy to Kinsta with just a few updates. 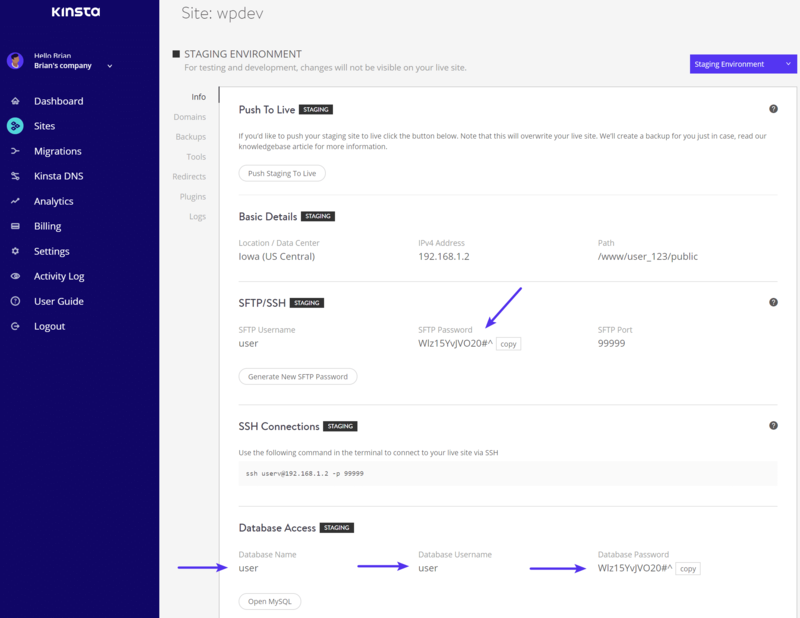 Since Kinsta provides everything from the web server standpoint, provisioning your staging and production environments do not apply. Bring up your MyKinsta dashboard and navigate to the WordPress site that you’re setting up with Bedrock and Trellis, along with your code editor opened to the trellis directory in your project. Replace example_123 in the paths above with the correct path provided from the MyKinsta dashboard. Make sure you have selected your Kinsta staging environment. Next, open trellis/group_vars/staging/vault.yml for editing by running ansible-vault edit group_vars/staging/vault.yml. We need to add db_user, db_name, and db_password to env. You can find the values for these on the main info screen for your site in the MyKinsta dashboard. Make sure that the host and SSH port match what is listed in the MyKinsta dashboard. Now, let’s repeat the same process above for the production environment. Make sure to toggle to your “live” environment in the MyKinsta dashboard. Trellis deploys try to reload php-fpm, which we need to remove from attempting to run on Kinsta’s servers. We also need to trigger the clearing of Kinsta’s cache on a deploy. Replace ask-support-rep above after asking a Kinsta support rep for the URL to clearing the cache on your site. Kinsta sites come with mu-plugins installed automatically. With Bedrock installs you’ll need to bring in the kinsta-mu-plugins package. The last thing you need to do is inform Kinsta of what to set the document root to. Hop on MyKinsta and ask the support team for your document root be updated to public/current/web. If you didn’t already get the clear cache URL earlier, also ask your support rep for this, and make sure that trellis/roles/deploy/hooks/finalize-after.yml is updated with the correct URL to clear Kinsta’s cache on a successful deploy. Better yet… setup a continuous integration service, such as CircleCI, to automatically run the deploy for you when you commit to either staging or master!